£25 delivered on amazon prime. Cheap price for one of the better rated tools. I'm sure the multi tool brigade can advise there is a bigger better one that can isolate kryptonite then put the head back on a poorly mannequin......but for £25 this seems decent. The uk warranty is dealt with by silva, the people who make compasses and other mountaineering gear. I dipped my toes into multitools a couple of years ago and theyve been very useful about the house. Changed a light fitting , put together furniture etc just with the tool. I got a leatherman sidekick but ive been disappointed with the quality...ive rounded a screwdriverhead and snapped the end off of the file. I was put off the gerbers as i perceived them as 'cheap' given my experience with the cheaper leatherman i'd probably try for a gerber next time. Got one of these and it's great for the price, come in handy a few times. Heat! Curses. You've just cost me twenty five quid! Lidl had one virtually the same a few weeks back think it was £6-99. Got one a couple of years ago and still going. Nice case it comes with. The knife locks which is handy but dont leave around if kids around. Also i think it makes these illegal to carry because of the locking mechanism. Might be wrong though. 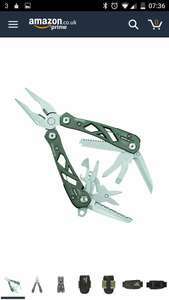 I think Leatherman multitools are better quality..... but this is a good price for this. Nearly bought but read a review of somebody who paid £19 for it, so I will wait it out I think, heat anyway though. Nearly bought but read a review of somebody who paid £19 for it, so I will …Nearly bought but read a review of somebody who paid £19 for it, so I will wait it out I think, heat anyway though. 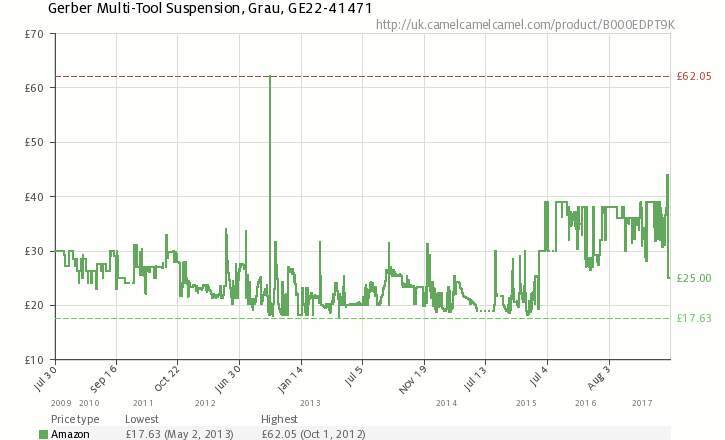 This Gerber Suspension was often posted on here as a deal. Many times it was under £20. But that was a good few years back and obviously before Brexit. £25 is probably the best price you'll get these days. This Gerber Suspension was often posted on here as a deal. Many times it …This Gerber Suspension was often posted on here as a deal. Many times it was under £20. But that was a good few years back and obviously before Brexit.£25 is probably the best price you'll get these days. I see, thanks. Should I take the punt? If you dont have a multitool and dont want to pay the higher price for a Leatherman, then its probably a reasonable buy. Personally i think Leathermans are far better quality..... but saying that, this Gerber will be far better than the no name cheap multitools. I bought this with the intention of carrying around in my bag but it's not street legal. The blades lock so anyone intending to do this should be aware. Its still available but temp OOS. It said that last night then this morning loads in. Just look under new and used available for the choice to buy at £25. Also there is a used like new for £23. Me too. And it is lifetime warranty.